My brother loves tofu. We used to have a running family joke that he would have to marry a tofu maker to satisfy his tofu cravings. He didn’t end up marrying a tofu-tiere, but his wife likes tofu well enough and they cook it a lot. I, on the other hand, never cook tofu. It’s not because I don’t like it, because I do; I just happened to marry someone who thinks he’s allergic to it. Funny though, I didn’t see any allergy symptoms after he gobbled up the agedashi tofu I made. 1. 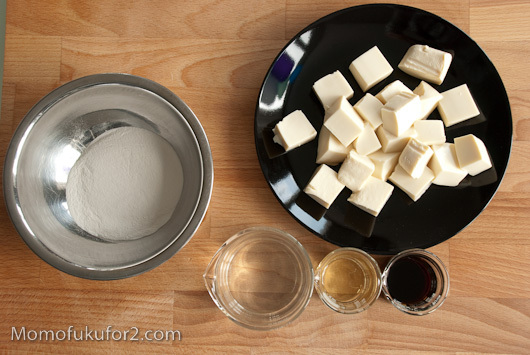 Gently cut the soft tofu into 1″ cubes and arrange the cubes on paper towels to drain for at least 20 minutes. Make sure you flip the cubes and change the paper. 2. Mix the sauce ingredients and heat gently. Keep warm until your tofu is fried. 3. Heat oil to 355˚F for frying. 4. Lightly dredge the tofu pieces in the flour and add to the hot oil. 5. Fry until golden, turning once. 7. Put the tofu in a dish, pour the warm sauce on and top with garnish if desired. - Draining the tofu helps it fry up crisp. - You don’t need to immerse the tofu in the oil, the oil only needs to come up at the half-way point of the tofu. - if you’ve never fried tofu before, you might be more comfortable using medium tofu as soft tofu is very delicate and falls apart easily. 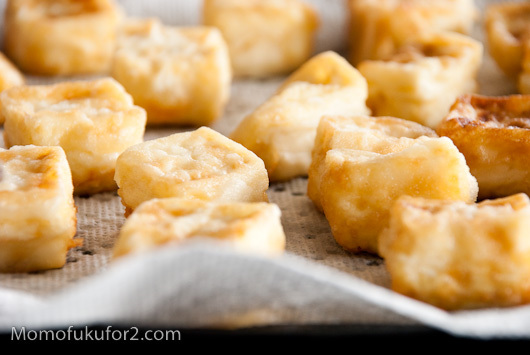 I never cook tofu at home but this looks os easy I’l have to try it, thanks@!! Bacon and tofu go good together, give it a try! Love the simplicity and the clean flavors; the arrangement of the plating is great! Potato starch gives you that crisp but slightly sticky/gummy texture that you get at izakayas, but I wanted a super-light coating so I went with flour. Traditionally they do use potato or cornstarch though. That looks phenomenal. I have an unnatural love of tofu. I can’t get enough of it. You and my brother should be tofu buddies. Momofuku Ssam is my favorite place to eat in NY too, just after a totally different kind of experience at Eleven Madison Park. 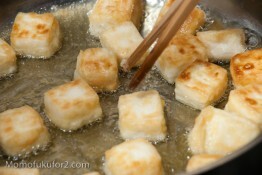 I learned to love tofu too traveling around Asia, and to be honest and release my guilt, I like it fried too. 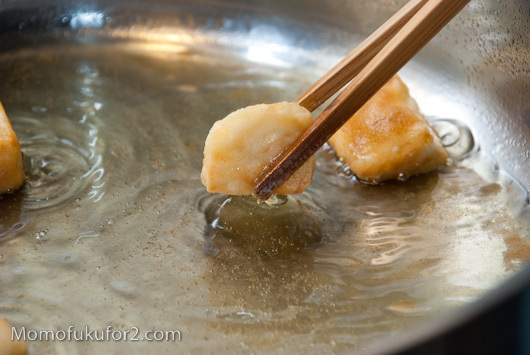 Have you thought about removing tofu and placing on wok rack. Allows dripping, air drying, and prevents sogginess. Works for me, just thought I would pass it on. Funny you should mention the wok rack, I was talking about getting one the other day! Wow!! 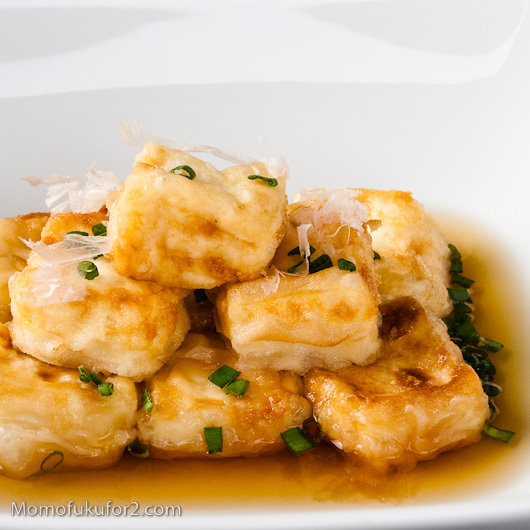 I LOVE tofu and Agedashi Tofu is a favourite!! will be trying this recipe with a vegetarian dashi!! Yum!! I used to get this Sesame Bean Curd dish at the local Chinese take-out joint when I lived in Brooklyn, and have never been able to reproduce the fried tofu, partly because the sauce never stuck correctly to it. But I never ever thought of flouring the tofu. I’m going to have to run out and get some tofu to try this! Mmm, I think sesame crusted tofu fried up would be delicious! I was never a fan of tofu until I found this recipe, thanks! This brings a whole new level to tofu. Thanks for posting. No problem, I love spreading tofu love! 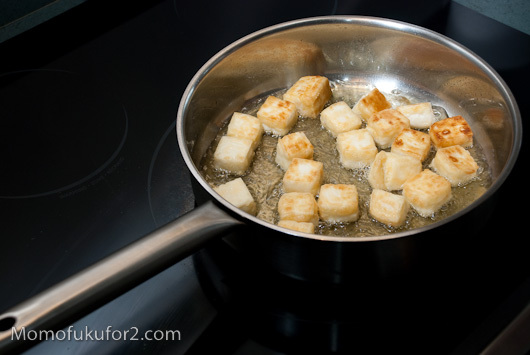 I used this method last night for 120 1″ cubes of tofu and they were fantastic. Tasted just like the ones I recently had in LA. Once you’ve done a large batch, put a serving in a plastic bag or container and freeze, then microwave when you want some quick tofu (can also be crisped on one of those revolving counter-top pizza ovens. I’ve always used cornstarch instead of flour to coat tofu as it gives it a much crispier texture. Some recipes call for Potato starch even but have yet to try that. Where can you find vegetarian dashi? Was inspired by a friends mother who makes agedashi with roasted baby eggplant, tofu, and head-on prawns so I went on line and found this easy to make recipe. Yum! I made this yesterday with a little soy sauce (didn’t have dashi though)and it was so good. Thanks for the recipe!